The room was very comfortable, clean and modern. Super close to all the shops, beach and public transport. The hotel restaurant was surprisingly delicious. Also massive props to the porter, carrying my large bag up stairs would not have been easy. Apartment was clean and modern looking. It had everything we needed. Location was good only 10 minutes walk to the Marina. Lots of entertainment and activities for all ages. Good variety of food. We asked for a crib in the bedroom and they set it up in the room before we arrived. The service was excellent. The staff were very nice. They had lots of entertainment and activities for families. The food was good. There was lots to choose from. The location was walking distance to three beaches and many stores to shop at. Very good apartment, new and nice style. Good facilities. Apartments..comfortable and clean Service good at pool cafe. Location very good. Friendly staff. The room was very nice, amazing bed. The buffet was fantastic with high quality of food and only 17.50 for as much as you can eat. The beach and town are only 5 minute walk away. Location of the area, the modern room we had. Enjoy it all and would recommend. Its beautiful. Lock in a great price for Prinsotel Alba & Spa – rated 8.5 by recent guests! Prinsotel Alba & Spa This rating is a reflection of how the property compares to the industry standard when it comes to price, facilities and services available. It's based on a self-evaluation by the property. Use this rating to help choose your stay! 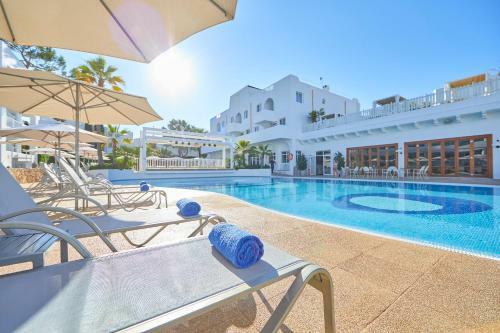 One of our top picks in Cala d´Or.Set in the resort of Cala d’Or, this recently renovated holiday complex is set just a few steps away from the crystal-clear Mediterranean waters of Cala Gran. Free WiFi is available throughout. The property has been built in a characteristic Balearic style, providing an authentic Majorcan experience. Relax in the sunshine on a sun lounger before diving into the large outdoor swimming pool. You can also enjoy a cool drink beside the pool from the outdoor bar. Refreshing drinks are also available in the lounge bar. The property is surrounded by Cala d’Or – one of Majorca’s most popular seaside and water sports resorts. From here, you can easily enjoy all that this beautiful island has to offer. Exploring at your own pace is made easy by the reception’s car and bike rental service. When would you like to stay at Prinsotel Alba & Spa? The maximum occupancy for this apartment is 4 (babies cannot be added). This apartment features a twin bedroom and a separate lounge with 2 sofa beds. There is a kitchenette, bathroom and furnished terrace. Free WiFi is available. The maximum occupancy for this apartment is 4 (babies cannot be admitted in addition to 4 guests). This apartment features a twin bedroom and a separate lounge with a sofa bed. There is a kitchenette, bathroom and furnished terrace. Free WiFi is available. Decorated in subtle colors, this air-conditioned apartment features 1 double bedroom and a separate lounge with 2 sofa beds. There is a kitchenette, bathroom and furnished terrace, and satellite TV, a safe and a telephone are all included. Free WiFi is available. This Junior Suite Room features one room with balcony, One big bed and one sofa bed. The bathroom comes with a hairdryer. Free Wifi, there is also a kitchen. House Rules Prinsotel Alba & Spa takes special requests – add in the next step! Prinsotel Alba &amp; Spa accepts these cards and reserves the right to temporarily hold an amount prior to arrival. Prinsotel Alba & Spa accepts these cards and reserves the right to temporarily hold an amount prior to arrival. Breakfast is rather expensive. In the evening the apartment was rather cold as the heating did not work properly. Wifi was very weak most of the time. Despite these points of criticism a very nice place! Dining was a bit chaotic noisy and rushed. Not enough staff at busy times ie restaurant/ reception . Entertainment poor. Used a nearby hotel for entertainment. Would have been easier to have self service drinks machines as took ages to serve coffees etc. at breakfast. Food a bit repetitive. no/poor kids entertainment in October and the food was very average. The small indoor pool was only open for the kids for two hours a day, in October in should have been more. Information about the spa was not provided at our arrival, therefore we discovered later than the spa was not included in the price of the room and that it is accessible only during limited hours of the day. We would have liked to be informed about the lack of parking slots around the hotel and that the road to access the hotel is one-way only, in order to not look around for parking places and getting lost. Coffee quality at the bar by the pool (the one open during the day) should be improved. One particular reception staff member extremely rude. Obsessed with trying to double charge. I had been given the hotel as a gift so didn't have the credit card with me obviously. She was insistent it was paid in full again to prove it wasn't fraud. I obviously refused to do this and provided details of the person who had bought it for me. She sent another guest to find me and send me to reception telling her I owed them money!!! Floors in room not clean, hair from previous guest every where, ( we used a towel to clean floor) kids disco was in stupid location next to pool, limited space everywhere. the Internet didn't work properly which was annoying. The games and activities that were on the board were not organized well. Some members of staff weren't very helpful or interested. Parking can be a problem. Cars were blocked in at the car park regularly. Close to everything in Cala D’Or. Clean and spacious apartments. Very comfortable bed too. Great pool and pool bar. Good value for money. Can’t get a sunbed, always taken up and thats going out of peak season. Not really a couples resort more for families with young children. Cleanliness ok but could have been better. Great location, very comfortable bed. Good powerful shower. Spacious apartment with microwave, fridge and 2 hob stove. The dishes were not included with the cleaning of the apartment. Nice beds & the burger & hot dog from the van is a lovely snack . Advertised free WiFi but it was of such poor quality we couldn’t pick it up.